Discussion in 'Released' started by hamstar, Nov 19, 2017. Entity Groups - Defines lists of entity (item, npc, etc.) types based on characteristics. More will be added. Custom Entities - Implements an entirely-lightweight entity type. Highly extensible. Packet Protocols - Substitutes for ModPacket to tighten up net code. Helps turn net code run-time/logic errors into compile-time errors. HUD map helpers - Lets you draw stuff to the map. Basic assorted helpers - Items, players, NPCs, projectiles, tiles, etc. Identity helpers - Identify items, NPCs, tiles, etc. by attributes. Player item/inventory helpers - Shop helpers, inventory finders, handling/unhanding, money, etc. Player movement helpers - Movement state, abilities, speed gauging, etc. UI helpers - Zoom position translating, key presses, etc. World helpers - Time, space, and world state helpers. Also lists biomes. Debug helpers - Persistent, updateable text messages, log file outputs with added info, etc. See the wiki page for feature overviews. Contributions welcome, but will need approval. New: Guides are now available for using advanced features. More planned to come. As of v1.2.0, this mod now comes with an in-game control panel. 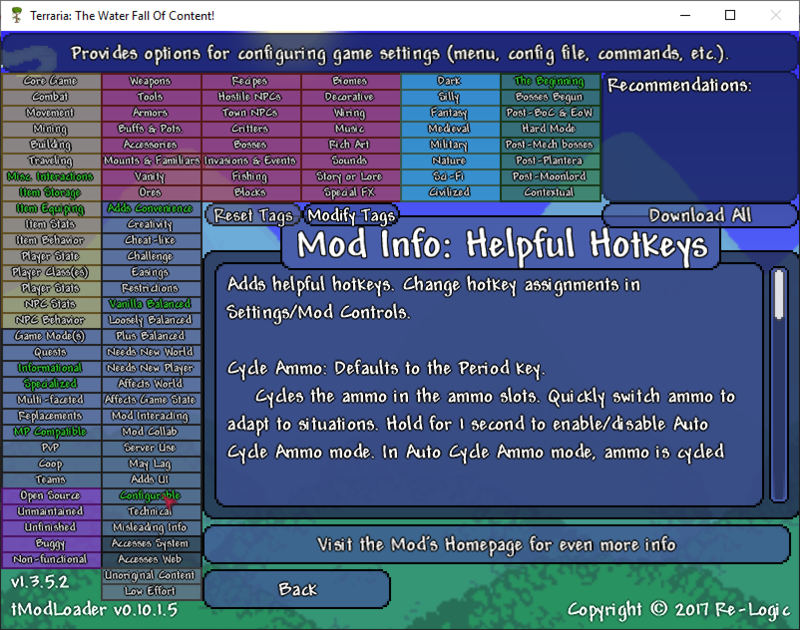 You can view all loaded mods, change their config files (if they're enabled for doing so) in-game, or even submit feedback or bug reports for specific mods! If you want any other control panel options to be added, let me know. As of v1.2.6, a mod locking button has been added to the control panel. With this, all currently active mods on the current world are locked; you cannot play that world without all of these mods active. New (v3.0) Mod tags may be supplies for any given mod, or used to search existing mods in the mod browser. Mods may also supply a recommendations list of their own for players to see and download (see instructions below). New to v1.2+ is the ability to enable github issues and edit config files in-game for any mods that support it. No mod dependency required! SSC = Prevents players modifying their character (or gear) outside of a server. HEROsMod = General server administration stuff. Nihilism = Allows removing specific items or NPCs from the game. Note: Be sure to use the mod's internal name (e.g. its file name, without extension); not its display name (click Open Mods Folder button in the mods list menu to see the list of mod files). Will the Terrarian, Flashkirby99, FiveSix78 and 2 others like this. Added "Any Garment" EG, corrected "Any Vanity Garment"
Added entity group "Any Boss"
Refactored CustomEntityManager to handle entity creation, retrieval, type id-ing, etc. I can't seem to close the control panel, any help? It should be closeable by pressing Escape (same key that accesses your inventory). Did you click on any of the text input fields? If none of these work, please tell me what mods your using, what your log.txt output contains, and whether this occurs from the start of the game, or only after you activate the panel. Well, I never clicked on any of the input fields, but my inventory key was switched to 'F' (for faster access). Also, is there any way to move the button to open it, or hide it all-together? It would normally be helpful, but it gets slightly in the way of my UI due to me using the Dual-Wielding mod. Since a fair number of people use this mod already (and to come), would it make sense to use this mod to generate a list of live servers for a server browsing website? Sounds really useful (I'm always in favor of website-driven lists and databases), though it seems like the overhead might be killer even on a beefy dedicated web server. How were you thinking of having the info updated? Or were you going to make it truly live where every visit is pulling info from active servers? Or did you mean that it'd generate a site specifically for the server ops to use, rather than a mega-database site you'd host? A hosted site will exist with a REST API that the mod calls every 15 or so seconds while running on a server to update the server's status on the site. It'll be up to them to connect to the servers in-game. Should work pretty well then. It also seems like it could be expanded in all kinds of really interesting ways, which is always a good thing! Is there any chance you'd be willing to supply public JSON output for some of the data? I'd love to integrate some of it into my tModLoader: Browserfied project. What exactly that would include, I'm not entirely sure. Off the top of my head I can think of listing servers that use a particular mod, or at least showing the amount that do with a link to a page on your site that effectively does the same thing. In getting ready for the server browser, I'm now wrapping up v1.4.0 (part 1, part 2). I'd appreciate it if someone could help test this version by hosting a server with active players with this running. Please report any issues via. the issue reporter, or else posting Logs.txt to this thread. Edit: See head post for latest version. I'm getting immediate crashes when I load the most current version of this. (I eliminated all other recently updated via elimination) Maybe something to do with checking updated mods in the menu? Could you tell me if your Logs.txt report anything? I'll be patching this shortly to try to catch a few of these problems. I am also having these problems. 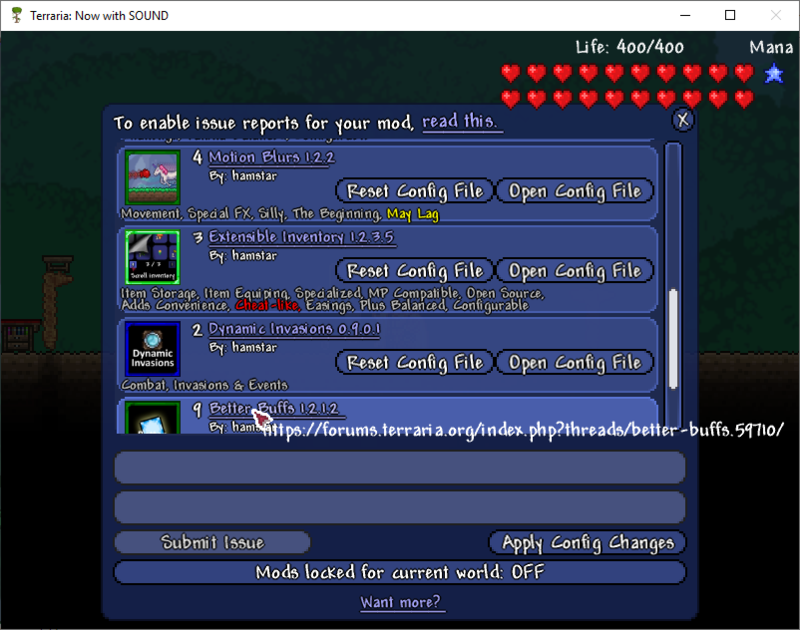 The second a world loads and I pop in-game, it hangs and gives a "Terraria.exe has stopped working" crash. There are no context policies. 0:000:00008 - 000244.03 Newtonsoft.Json.JsonReaderException: Unexpected character encountered while parsing value: <. Path '', line 0, position 0. 0:000:00008 - 000244.04 Newtonsoft.Json.JsonReaderException: Unexpected character encountered while parsing value: <. Path '', line 0, position 0. 0:000:00008 - 000244.05 Newtonsoft.Json.JsonReaderException: Unexpected character encountered while parsing value: <. Path '', line 0, position 0. 0:000:00008 - 000244.06 Newtonsoft.Json.JsonReaderException: Unexpected character encountered while parsing value: <. Path '', line 0, position 0. 0:000:00008 - 000244.07 Newtonsoft.Json.JsonReaderException: Unexpected character encountered while parsing value: <. Path '', line 0, position 0. 0:000:00008 - 000244.08 Newtonsoft.Json.JsonReaderException: Unexpected character encountered while parsing value: <. Path '', line 0, position 0. 0:000:00008 - 000244.13 Newtonsoft.Json.JsonReaderException: Unexpected character encountered while parsing value: <. Path '', line 0, position 0. I'm just chipping away at the errors thus far. I added a semi-major change in preparation for an upcoming server browser, but my time is being divided the last few days, so progress is a bit choppy. Tell me if the new v1.4.0.6 improves things. It seems to pause for 5 seconds or so when I first start up and load up a world. After that, I can exit a world and load it back in just fine, without the pause. Just seems to pause when you first load a world after starting the program. Hey hamstar, from my feedback about Town Portal (Wormholes mod) sending my portal to world center instead of my spawn point, I looked into the cause and sent you a pull request for Hamstar Helpers. Thanks!